The Warere is housed in a restored Arab mansion, where each room has been uniquely furnished using traditional Zanzibari furniture and vitenge cloth. Our deluxe rooms offer a balcony where you can watch island life pass below you and are fully airconditioned. 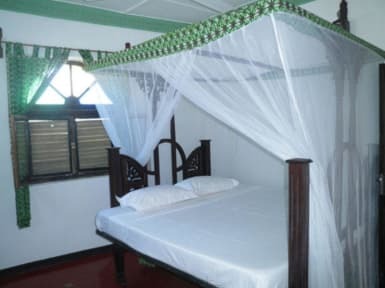 All our rooms have private bathrooms, AC, fans and mosquito netting. The Arab-influenced rooftop terrace affords breath-taking views of the harbor and Stone Town. The Warere has been newly renovated to ensure your stay is as comfortable as possible. 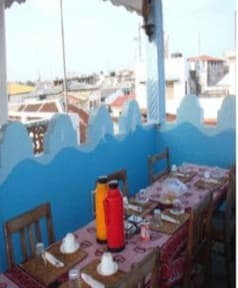 Come relax with a cold drink on our rooftop terrace after taking in the sites of Stone town. Let our exclusive townhouse be your home away from home in this exotic spice island, karibu. We now offer free wifi access. Only cash accpeted as payment of the balance upon arrival. Credit card payments incur a 5% bank charge.